Real gross domestic product is a measurement of economic output that accounts for the effects of inflation or deflation. It provides a more realistic assessment of growth than nominal GDP. Without real GDP, it could seem like a country is producing more when it's only that prices have gone up. When you hear reports of a country’s GDP that don’t specify the type of GDP, it is likely to be nominal GDP. Nominal GDP includes both prices and growth, while real GDP is pure growth. It’s what nominal GDP would have been if there were no price changes from the base year. As a result, nominal GDP is higher. The U.S. Bureau of Economic Analysis reports both real and nominal GDP. It calculates real U.S. GDP as an annual rate from a designated base year. It excludes imports and foreign income from American companies and people. That negates the impact of exchange rates. The line chart below shows the annual rate for both the U.S. real and nominal GDPs from 1998 to 2017. Hover over each point to compare differences between both GDPs. 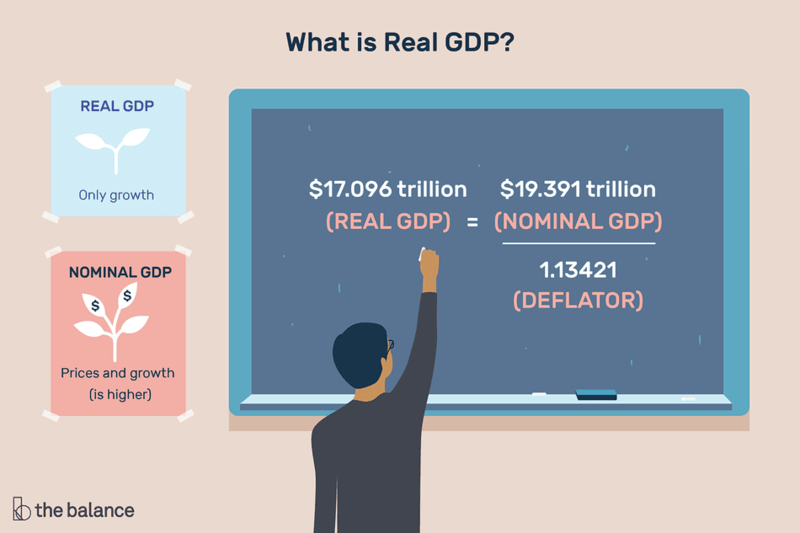 For example, real GDP was $17.096 trillion in 2017. The nominal GDP was $19.391 trillion. The deflator was 1.13421. $17.096 trillion = $19.391 trillion / 1.13421. The Bureau of Economic Analysis calculates the deflator for the United States. It measures inflation since the designated base year. That is the ratio of what it would cost today compared to the base year. It's similar to the Consumer Price Index but is weighted differently. The BEA publishes so-called implicit price deflators in the national income products account or NIPA table 1.1.9. You can find it in the Interactive Tables section of the BEA website. Real GDP measures the final output of all goods and services produced in the United States in the prior quarter. It only counts final production. The BEA does not count the parts manufactured to make the car, such as tires, steering wheel, or engine. The GDP components report divides production into categories, so you can tell what industry contributes the most to the economy. The BEA does not incorporate the external costs of production to the economy. These are costs that are created by an industry but borne by society at large. Examples include air and water pollution, nuclear waste, and deforestation. Real GDP also measures services. These include your hairdresser, your bank, and even the services provided by non-profits such as Goodwill. It includes services provided by the U.S. military, even when troops are overseas. It also measures housing services provided by and for persons who own and live in their home, including maid service. But the BEA doesn't count some services because they're too difficult to measure. These include unpaid childcare, elder care or housework, volunteer work for charities, or illegal or black-market activities. The book, "The Real Wealth of Nations," argues that the lack of due regard of these services provides a false measurement of true U.S. production. Real GDP is used to compute economic growth. The percentage change in real GDP is the GDP growth rate. You need to use real GDP so you can be sure you’re calculating real growth, not just price and wage increases. Here's how to calculate the GDP growth rate. Real GDP can then be used to determine if the U.S. economy is growing more quickly or more slowly than the quarter before, or the same quarter the year before. In this way, you can tell where the economy is in the business cycle. Here's the real U.S. GDP growth rate for every year since 1929. The ideal GDP growth rate is between 2 percent and 3 percent. The BEA revises its quarterly estimate each month when it receives new data. You can see how the growth rate plummeted during the financial crisis in GDP current statistics. The GDP growth rate is critical for investors to adjust the asset allocation in their portfolios. They also compare countries' GDP growth rates. Countries with strong growth attract more investors for their corporate stocks, bonds, and even their sovereign debt. The Federal Reserve reviews GDP growth when deciding on the fed funds rate. It will raise the rate when growth is too fast and lower it when growth is too slow. First, it tells you how much the economy is producing. Real GDP can be used to compare the size of economies throughout the world. But, to compensate for the different cost of living between countries, you must use purchasing power parity. Other ways to compare GDP by country is through calculation and comparison of official exchange rates and GDP per capita. You must use nominal GDP when your other variables don't exclude for inflation. For example, if you are comparing debt to GDP, you've got to use nominal GDP since a country's debt is also nominal. To see the historical trend of U.S. debt to nominal GDP for every year, go as far back as 1929. When the GDP growth rate is slowing down or even contracting, the Fed will lower interest rates to stimulate growth. If you are buying a home when this happens, you'd want an adjustable-rate mortgage so you can take advantage of future lower rates. You might even want to think about downsizing. Declining GDP growth rates can also lead to a recession, which means you should prepare for layoffs. If GDP growth rates are increasing, then you'd want to consider a fixed-rate mortgage. That way, you can lock in low-interest rates, because the Fed raises them if growth is too fast.